Our children are fully grown, so we now have the pleasure of enjoying kid’s appropriate attractions with our grand-kids. 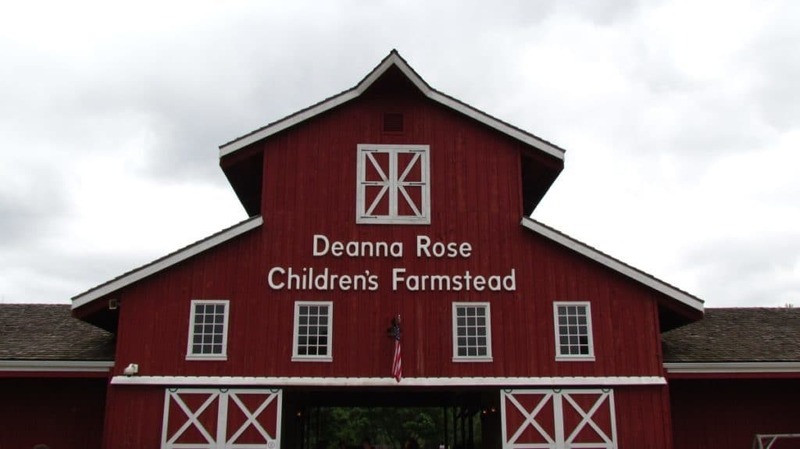 Recently, we took them to Deanna Rose Children’s Farmstead located at 13800 Switzer, in Overland Park, Kansas. Crystal has had the pleasure of visiting this unique site in the past, but this would be my first experience. The night before had been a rain-out, but on this day it was just cloudy. That actually made it not too bad for an August day. The regular admission for Deanna Rose Farmstead is $2.00 per person. Yes, it is really just two bucks! When I heard this, I wondered why we never visited more often. I mean, where can you get any kind of substantial entertainment for that price? Especially a place that will hold the attention of children for any length of time. Now rest assured you can spend more than that amount during a visit. There are specialty attractions that do cost extra, but there are plenty of things to do without the added costs. We happened to arrive on one of their two free days each year, (We had no idea!) so we were a little more open to allowing the grand-kids to splurge on some of the extras. After entering, I let the kids choose the path. Like the majority of people, they turned right. I have read reports that say the average person will choose the path on the right or turn right on entering a building, like a grocery store. Many dollars have been poured into these kinds of studies, and I have the tendency to make note of the way things are arranged in stores to see if they are making use of this particular piece of information. 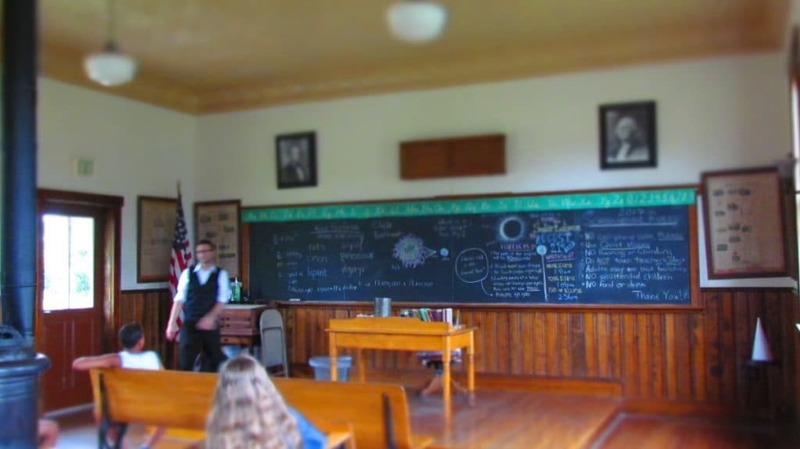 Back to our visit, taking this path led us to a replica turn-of-the-century one room schoolhouse. Here we watched a staff member, as he helped some of the guests work through a math problem. Of course, these days they have calculators built into their phones, so the answers came a little easier. A little further down the path we came upon the Mining Camp. 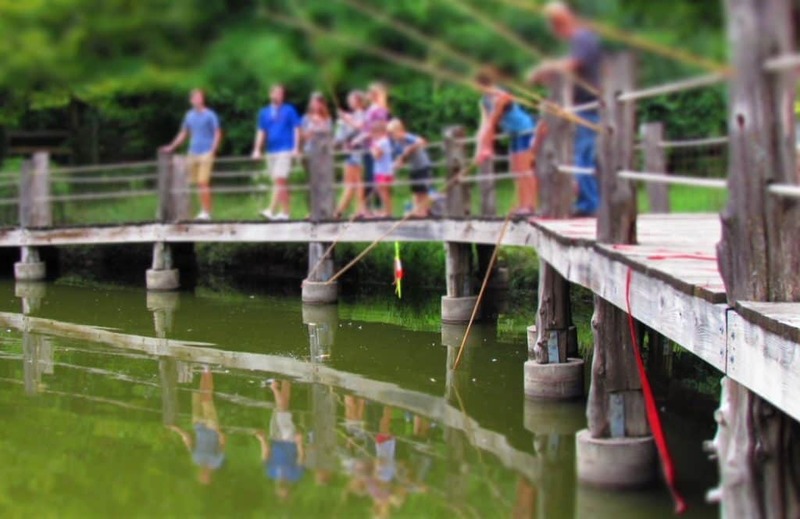 Here kids of all ages can mine for treasure with the help of the sluice. Bags of “rough” can be purchased from staff at $5.00 for small or $8.00 for large. The bags are filled with a course sand that has assorted raw minerals embedded. These are all genuine gemstones, and the package comes with a card that can be used to identify the treasures found after “mining”. Our 8 year-old granddaughter was eager to try her had at this. After she started discovering some treasures, our 12 year-old grandson suddenly became interested in doing his own mining. Both came away with a bag full of memories from their experience. The Dairy Barn was our next destination, and was met with mixed levels of excitement. Our grandson thought it was a little boring, but our granddaughter was having a ball. She even got a lesson in how to milk a cow from grandma Crystal. They have a small theater inside the barn, which shows a revolving video about dairy farming. They also had a few barnyard animals on display, and the kids liked petting the Angora goat. After this, we walked through the Indian Camp, which is a replica of a Kanza Indian encampment. At this point, we made it to the fishing lake area. 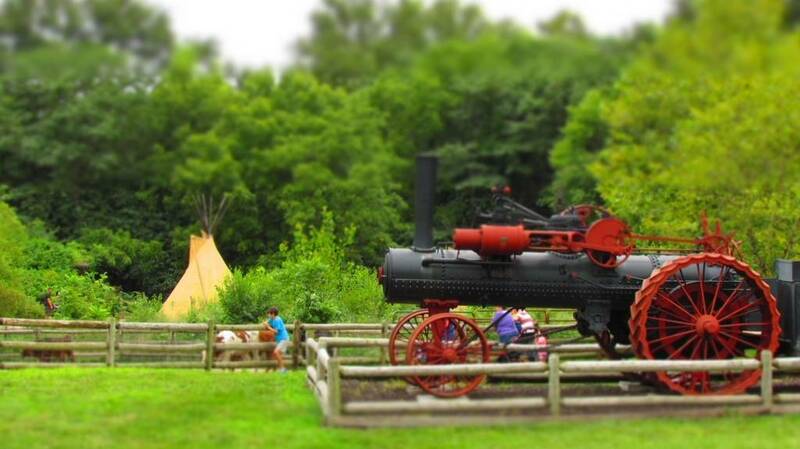 This part of the Deanna Rose Farmstead is packed with activities, as well as people. After feeding a bottle to the baby goats, ($1.00 per bottle charge) the grand-kids spent some time on the pedal tractors. Just imagine miniature John Deere tractors, but with pedals. We strolled over to the fishing pond, but no one in our group was wanting to try their luck. You can rent a cane pole with worms for $3.00 each. 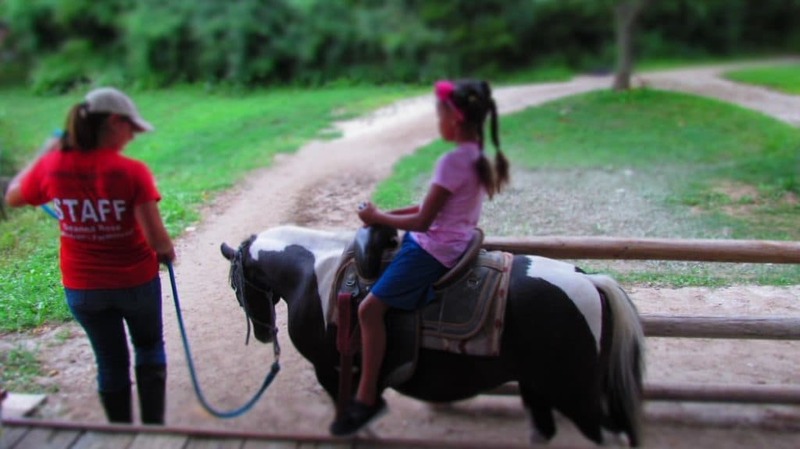 Instead, our granddaughter decided she wanted a pony ride. These are limited to children 3 to 10 years old, so our grandson had to just watch. Pony rides are $3.00 each, but a gentleman from Baldwin City happened to have two tickets he couldn’t use, and offered them to us. After our granddaughter’s ride, she offered the second ticket to another family, and learned a lesson about paying it forward. As we continued around the loop, we started our way back toward the front of the farmstead. The next area we came to was the blacksmith shop. Here we watched as he restarted his fire, which had died out during his lunch break. As he worked, we talked about his travels in the southwest. It was a nice break from the busy rushing of earlier. The grand-kids took this time to rest up for the next walk. As others arrived, the blacksmith explained a little about some of the pieces he had on display. We stayed a while longer, but I could see the young ones getting restless, so it was our sign to move on. Now we were in the heart of a grouping of business buildings. The first was the local bank, where inside we had the chance to guess the amount of pennies in a giant bank. If you guess right you win them, but none of us were on target. Next we visited the general store, where we grabbed some drinks to quench our thirsts. I stopped for a while to catch up on my social media posts (It’s our chance to keep all of our followers up to date.) While I sat there, the others headed into the play area, which is obviously quite popular. When I caught up they were heading on down the path toward the nature area. There is a fairly large section dedicated to native wildlife, as well as flora and fauna. Here we saw prairie dogs, birds of prey, peacocks, turkeys, bison, longhorn cattle, and even a bobcat. There are a lot of planters filled with beautiful flowers, and in one area we came across a nature walk. With the previous rains, we wanted to avoid any chances of a muddy walk. We decided to just visit the butterfly garden, which is filled with colorful plants. I am a big fan of texture mixtures in plantings, and this was a great place to see some nice variations.